This article is about the allocation of a first-preference vote to a particular candidate. For systems which use preferential voting, see Preferential voting. In ranked-voting systems, a first-preference vote (or first preference, 1st preference, or primary vote) is the individual voter's first choice amongst (possibly) many. Every such system is designed, in the first instance, to align the result with the candidate(s)/option(s) which have obtained the highest number of first preferences, and then, if necessary, this criterion is altered to allow for proportionality, and to carry surplus and/or ineffective votes to second and subsequent options depending on the system involved. Ballots with no clear first preference (no preference, or multiple first preferences) are generally regarded as a spoilt vote The term is also used (trivially) in first past the post systems. First-preference votes are used by psephologists and the print and broadcast media to broadly describe the state of the parties at elections and the swing between elections. The term is much-used in Australian politics, where preferential voting has been universal at federal, state, and local levels since the 1920s. 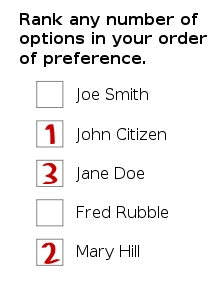 ^ "Explainer: What is preferential voting?". Special Broadcasting Service. ^ "How the Dáil is Elected" (PDF). Department of the Environment, Community and Local Government, (Ireland). November 2014. p. 10. Retrieved 24 May 2015. ^ ""Full transcript - David Cameron - The case against AV - London - 18 February 2011"". New Statesman. 18 February 2011. Retrieved 24 May 2015. ^ a b "By-Election: Carlow-Kilkenny". RTÉ. 23 May 2015. Retrieved 24 May 2015. ^ a b "First Preference Vote". University of Western Australia. Retrieved 24 May 2015. ^ "Cooma-Monaro Shire Council: Summary of First Preference Votes for each Candidate". Local Government Elections 2012. Electoral Commission of New South Wales. 14 September 2012. Retrieved 7 October 2012. This election-related article is a stub. You can help Wikipedia by expanding it. This page was last edited on 12 February 2019, at 06:17 (UTC).